We present here a protocol for the isolation of islets from the mouse model of type 2 diabetes, Leprdb and details of a live-cell assay for measurement of insulin secretion from intact islets that utilizes 2 photon microscopy. Do, O. H., Low, J. T., Thorn, P. Leprdb Mouse Model of Type 2 Diabetes: Pancreatic Islet Isolation and Live-cell 2-Photon Imaging Of Intact Islets. J. Vis. Exp. (99), e52632, doi:10.3791/52632 (2015). Type 2 diabetes is a chronic disease affecting 382 million people in 2013, and is expected to rise to 592 million by 2035 1. During the past 2 decades, the role of beta-cell dysfunction in type 2 diabetes has been clearly established 2. Research progress has required methods for the isolation of pancreatic islets. The protocol of the islet isolation presented here shares many common steps with protocols from other groups, with some modifications to improve the yield and quality of isolated islets from both the wild type and diabetic Leprdb (db/db) mice. A live-cell 2-photon imaging method is then presented that can be used to investigate the control of insulin secretion within islets. The role of beta-cell dysfunction in disease has been widely recognized 3,4. Cell lines such as the MIN6 and INS-1 are useful tools to understand the biology of beta cell behavior. However, the physiological control of insulin secretion takes place within the islets of Langerhans. These islets contain thousands of tightly packed beta cells, as well as blood vessels and other endocrine cell types. This environment within the islet influences insulin secretion and is likely to be important in diabetes. Therefore, to understand the physiological control of insulin secretion, and the pathophysiology of disease, it is essential to study intact islets. Live human islets and, in particular, human islets from type 2 diabetes patients are difficult to obtain. In addition, human islets have limited possibilities for experimental molecular manipulation. Researchers have therefore employed islets from animals and animal models of type 2 diabetes. One such disease model is the db/db mouse. This is a spontaneous mutation that models type 2 diabetes with a phenotype progression that closely parallels human disease 5,6. The protocol presented here for islet isolation from diabetic db/db mice has many steps in common with other groups with some refinements for better yield, purification and enhanced islet survival. The live-cell 2-photon assay described here enables researchers to quantify the number and evaluate the characteristics of single insulin-containing granules from many cells of diabetic7 and wild type islets 8,9. NOTE: All present experiments were performed according to local animal ethics procedures of the University of Queensland (approved by the University of Queensland, Anatomical Biosciences Ethics Committee). For the pancreatic digestion, use a mixture of liberase and collagenase type IV. Dilute liberase TL (thermolysin low) 1 vial of 5 mg with 26 ml of DMEM (Dulbecco’s Modified Eagle Medium). Prepare collagenase type IV in Hank’s buffer at a concentration of 0.5mg/ml, supplemented with 5mM HEPES, 0.5mM CaCl2, 0.1mg/ml DNAse and 1mg/ml bovine serum albumin. Mix the liberase TL and collagenase solutions in a ratio of 4:1 (by volume), i.e., 4 ml liberase TL + 1 ml collagenase. Aliquot the mixture of enzymes to 2.5ml each and store at -20 °C. NOTE: The tissue incubation times vary a bit between batches of enzyme (30 sec to 1 min difference). Therefore, a batch test may be required. Dissolve one vial of RPMI 1640 powder in 1 L of water at RT and supplement with 2 g NaHCO3, 4.02 g HEPES. Combine the RPMI isolation media in a large conical flask, mix with magnetic stirrer, adjust to pH 7.4 with NaOH, filter sterilize and store at 4 °C. Use RPMI culture media, with 10% fetal bovine serum and 1% antibiotics (i.e., penicillin 100 U/ml, streptomycin 100 μg/ml). Sacrifice mice by cervical dislocation or CO2 asphyxiation according to the local institution’s ethics procedures. Spray the mouse body thoroughly with 70% ethanol. Use 2 long cuts laterally through the abdominal skin and peritoneum to make a V-shaped flap. Pull the flap of the skin up to uncover the entire abdominal cavity, put aside the bowel and keep the liver in place by a folded tissue paper to reveal the common bile duct (Figures 1 and 2). Put the animal so that the head toward the surgeon and the tail away from the surgeon. Apply a vascular clamp at the ampulla on the duodenum wall to block the injected enzymes from entering the duodenum (Figure 1). NOTE: This is an important step as it determines whether the injected enzymes will go into the pancreatic duct and perfuse the pancreas or reflux to the injection site (over clamp) or go into the duodenum (under clamp). 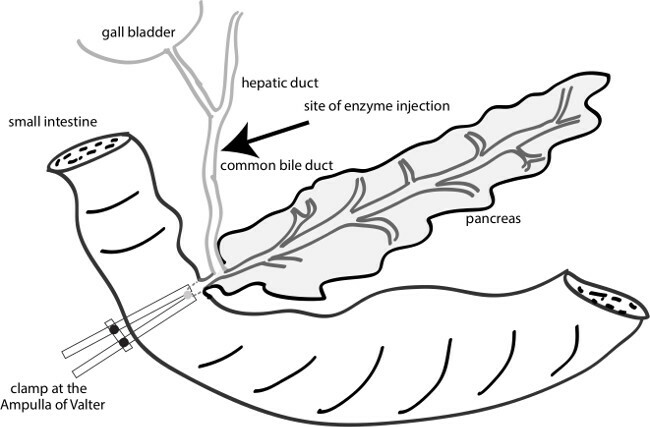 Cannulate the common bile duct with a 31 G needle near the junction of the common hepatic duct and cystic duct (Figure 1) and leave room for a second injection if the pancreas fails to perfuse the first time. Slowly (over ~10 sec) inject about 2 ml of cold enzyme mixture into the mouse common bile duct. NOTE: The pancreas will be perfused quickly if the clamp is in the right position. Adjust the clamp position if the needle is inside the common bile duct but cannot perfuse the pancreas (i.e., move up the clamp a bit away from the liver if over clamped or move it down a bit to the liver if under clamped). NOTE: The needle sometimes goes into the surrounding capsule rather than the lumen of the duct. A useful sign to check whether the needle is inside the common bile duct is the dilation of the duct when injecting. If the pancreas fails to perfuse, an alternative is the enzyme mixture could be injected to multiple sites of the pancreas with lower yield expected. The perfusion of the left site of the pancreas (the splenic lobe) is important for maximization of the islet yield. After the pancreas is perfused, quickly remove the pancreas, put it into a vial (~20 ml, glass) and incubate for ~19 min in a 37 °C water bath. NOTE: The incubation time can vary a bit depending on the mouse strain and age. After the incubation time, stop the digestion process by adding ~20 ml of cold isolation media. Shake the vial gently to disrupt the pancreas and pour it through a normal tea sieve (pore diameter of 1 mm) into a sterile 50 ml tube. Top up the tube with isolation media and centrifuge at 400 x g for 1 min at 4 °C with brake off. Dissolve the pellet in the isolation media again and transfer to two 15 ml tubes, then centrifuge at 400 x g for 1 min at 4°C with brake off. After aspiration the supernatant, mix the two pellets well with 6 ml of density gradient cell separation media (Histopaque 1077 solution) per tube by vortexing or pipetting up and down. Then gently add ~6 ml of the isolation media to the side of the tube on top of the density gradient separation media and centrifuge at 100 x g for 15 min at 4 °C with brake off. Collect the supernatant in the upper (isolation media), middle and lower (density gradient cell separation media) layer in 3 separate dishes. Handpick the islets in these 3 dishes, using a pipette under a dissecting microscope. NOTE: The middle layer contains most of the islets. Islets are recognized as compact structures of ~ 50 to 500 μm in size (Figure 3). We obtain ~200 islets in WT mice and 300- <100 islets in db/db mice. To help the islets recover from the enzyme digestion, culture groups of 40 islets in a 25 cm petri dish with 6ml RPMI culture media (10mM glucose) at 37 °C, 5% /95% CO2/O2 for 2 days before live-cell 2-photon imaging. Change the culture media daily. Prepare the sodium rich extracellular buffer for the 2-photon assay with 140 mM NaCl, 5 mM KCl, 2.5 mM CaCl2, 1 mM MgCl2, 5 mM NaHCO3 and 10 mM HEPES. For the 2-photon assay, prepare stock SRB 8 mM in extracellular buffer, aliquot into small tubes and store at -20 °C. Dilute the stock SRB 1:10 in fresh extracellular buffer to get a working concentration of 0.8 mM. First, pre-incubate 2-day cultured islets in 3 mM glucose extracellular buffer for 30 min. NOTE: We use islets between 2 and 5 days in culture. Then, place a glass slide onto the thermo-control chamber mounted on the microscope stage. Use grease to prevent the leaking of solution. Cover the chamber with 500 μl of extracellular buffer containing 0.8 mM SRB with different glucose concentrations (3 mM, 6 mM, 15 mM and 20 mM glucose). Next, place the pre-incubated islet into the middle of the chamber and focus at 3-4 cell layers into the islet where, in rodent islets, immunostaining for insulin shows that most cells are beta-cells. NOTE: The SRB will outline all the cell membrane of the islet quickly and the islet is ready to image. 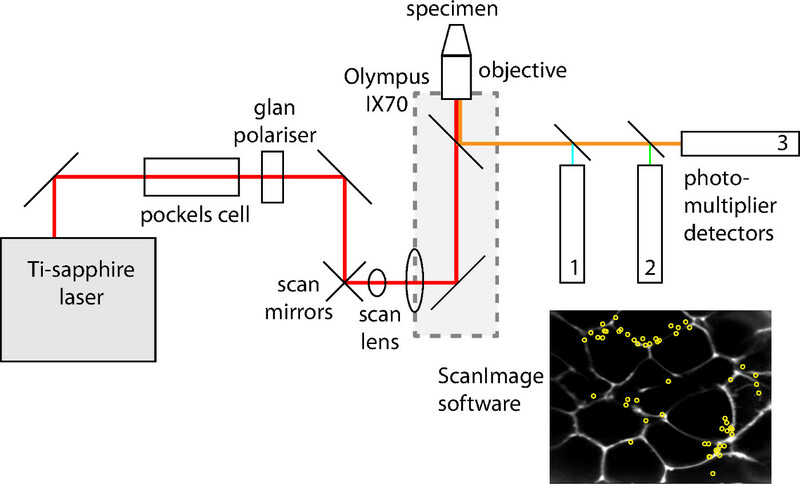 Use a 2-photon microscope with a 60X oil immersion objective (NA 1.42) and imaging software (e.g., ScanImage 11). Figure 4 illustrates a typical microscopy arrangement. Image exocytic events using SRB as a membrane impermeant fluorescent extracellular marker excited by femtosecond laser pulses at 880 nm, with fluorescence detected at 550-650 nm. Record the islet responses to stimulation. Identify single exocytic events by the sudden appearance of a small fluorescent spot (resolution 10 pixels/µm) and confirm by the fast rising phase of the fluorescent signal over a region of interest (~0.78 μm2). 2-photon imaging is an indirect assay to measure insulin secretion at the level of single insulin granule fusion. In response to stimuli such as glucose or high potassium, insulin granules fuse with the plasma membrane and the extracellular dye SRB enters the granules which results in the appearance of a sudden fluorescent spot ~400 nm in diameter (Figure 5). Various experiments have been carried out to validate this assay as a measurement of fusion of insulin-containing granules like the glucose dose dependent of increasing number of granule fusion events with the expected amount of insulin secretion, the consistent size of the responded cells in the 2 photon with that of a beta cell, the similar granule diameter measured by the 2 photon and the electron microscope, the colocalization of the dye uptake and insulin staining 8. Within the time of recording, all the exocytic events in response to the stimulus are identified and the location of the events, the time of the appearance, the duration and type of the fusion events like kiss-and-run or full fusion are characterized (Figure 5, 6). These characteristics of the fusion process are valuable for assessing any defect in the granule fusion in models of type 2 diabetes. Our previous report using this method shows that the defect in diabetic db/db islets is the loss of full granule fusion and not a change in the characteristics of the kinetics of individual granule fusion 7. Furthermore, we show that the biggest factor in the decreased in insulin secretion in disease is a reduction in the number of responsive cells 7. Figure 1: A diagram of the sites of clamping and injection. Inject the enzymes to the common bile duct near the junction of the common hepatic duct and cystic duct. Clamp the ampulla of Valter by a vascular clamp to facilitate the injected enzyme to the pancreatic duct. Figure 2: The injection process in the mice. 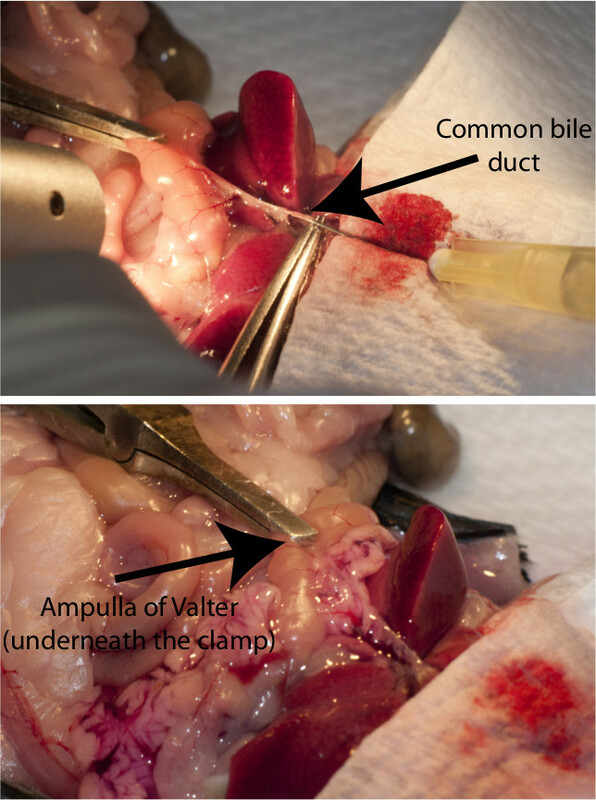 Top figure illustrates the needle inside the common bile duct with a vascular clamp applied at the ampulla of Valter. Bottom figure shows the liberase-perfused pancreas after injection. Figure 3: Typical images of Wild type and db/db isolated islets. (A) Wild type isolated islets. (B) db/db isolated islets. (C) Under-digested islets with attached acinar cells (arrows). (D) Over-digested islets with small and fuzzy islets (arrows). Please click here to view a larger version of this figure. Figure 4: The main components of the custom-made 2 photon microscope. Please click here to view a larger version of this figure. Figure 5: Example of a single insulin granule fusion event as recorded with 2 photon microscopy. Left figure represents the cell before (A) and after (B) the appearance of an exocytic event (arrow) in response to 15 mM glucose stimulation. (C) illustrates the SRB labeling with the entering of the extracellular dye SRB into the granule when it fuses with the plasma membrane. (D) shows the fluorescence intensity over a region of interest of an exocytic event as well as the sequential images of this exocytic event (scale bar 1 μm). Image modified from Do et al 2014 7. Please click here to view a larger version of this figure. Figure 6: Responses of the wild type and diabetic db/db islets under the 2-photon microscope with SRB as the extracellular dye. In these experiments insulin granule fusion events in response to 15mM glucose stimulation are recorded. Yellow circles are sites of the exocytic events during 20 min of recording. Image modified from Do et al 2014 7. The most critical factor in the islet isolation is the initial perfusion of the pancreas; an under perfused pancreas results in a considerably lower islet yield. Other factors also affect the isolation quality such as the digestion time and the level of shaking which could partly compensate for the level of perfusion. For example, a fully perfused pancreas will need to be incubated at 37 °C for ~18 min 30 sec while shaking gently, in contrast an under digested pancreas may require ~20 min digestion with harder shaking. The mixture of two digestion enzymes in our hands provides better islet isolation than either one alone. For the collagenase only method, the digestion time critically affects the islet yield and time differences of only 30 sec can dramatically affect quality. For liberase only, the yield is acceptable but under-digestion sometimes happens, we believe that the addition of collagenase helps to digest the connective tissue better. We have found the db/db mice have diverse diabetic phenotypes, even among siblings. As a result, glucose tolerance tests on each animal before sacrificing are routinely performed. This enables classification the animals in terms of resting glucose levels and the area under the curve in response to injected glucose. There are a number of possible experiments that can be performed after the islets have been isolated. Isolated islets can be fixed in paraformaldehyde or methanol immediately after isolation and used in immunofluorescence staining to determine the location of proteins of interest 10. Isolated islets can be dispersed in to single cells. This can be done on the same day of islet isolation or after a few days of islet culture. The single cells are then plated out and it is this preparation that has been the mainstay for techniques such as patch clamp and total internal reflection microscopy. In experiments that measure insulin secretion, as well as for live-cell 2-photon imaging, we have found that islets require 2 days in culture in order to give reproducible data. What is happening in culture is not well understood but is thought to be a period of recovery from the isolation and digestion process. The 2-photon technique presented here enables researchers to image the insulin secretory process at the level of individual granule fusion from many cells within intact islets. We have found that the number of granule fusion events and their timing is consistent with the amounts and temporal profile of insulin secretion 8. This suggests the method is detecting the majority of insulin granule fusion events. Given that dye entry in to the fusing granules is not a specific method for detecting insulin granule fusion events we have gone to great lengths to conduct control experiments to demonstrate that insulin granule fusion in beta cells are being studied 7,8. However, a component of this evidence is dependent on the structure of the rodent islet where beta cells are enriched in the core of the islet. The different structure of human islets, where different endocrine cells are scattered throughout the islet volume, would require additional methods to identify beta cells. There are a number of technical problems with the 2-photon microscope that are generic to all imaging approaches. For example, we carefully balance the opposing factors of trying to get enough light in to the islets so that we can reduce the gain of the detectors, and therefore reduce noise, with putting so much light in to the islets that we cause cell damage. In our system, a Pockels cell is used to attenuate the pulsed laser (Figure 3); all commercial systems have mechanisms to alter the intensity of light that falls on to the specimen. In summary, the combination of careful isolation of db/db islets and whole-islet 2 photon microscopy present new opportunities to study the processes of insulin secretion and determine the key defective elements in type 2 diabetes. This work was supported by an Australian Research Council Grant DP110100642 (to PT) and National Health and Medical Research Council Grants APP1002520 and APP1059426 (to PT and HYG). Guariguata, L., et al. Global estimates of diabetes prevalence for 2013 and projections for 2035. Diabetes Research and Clinical Practice. 103, 137-149 (2014). Ashcroft, F. M., Rorsman, P. Diabetes mellitus and the beta cell: The last ten years. Cell. 148, 1160-1171 (2012). Weir, G. C., Bonner-Weir, S. Five stages of evolving beta-cell dysfunction during progression to diabetes. Diabetes. 53, S16-S21 (2004). Kjorholt, C., Akerfeldt, M. C., Biden, T. J., Laybutt, D. R. Chronic hyperglycemia, independent of plasma lipid levels, is sufficient for the loss of beta-cell differentiation and secretory function in the db/db mouse model of diabetes. Diabetes. 54, 2755-2763 (2005). Wang, Y. W., et al. Spontaneous type 2 diabetic rodent models. Journal of Diabetes Research. (2013). Hummel, K. P., Dickie, M. M., Coleman, D. L. Diabetes a new mutation in mouse. Science. 153, 1127-1128 (1966). Do, O. H., Low, J. T., Gaisano, H. Y., Thorn, P. The secretory deficit in islets from db/db mice is mainly due to a loss of responding beta cells. Diabetologia. 57, 1400-1409 (2014). Low, J. T., et al. Glucose principally regulates insulin secretion in mouse islets by controlling the numbers of granule fusion events per cell. Diabetologia. 56, 2629-2637 (2013). Takahashi, N., Kishimoto, T., Nemoto, T., Kadowaki, T., Kasai, H. Fusion pore dynamics and insulin granule exocytosis in the pancreatic islet. Science. 297, 1349-1352 (2002). Low, J. T., et al. Insulin secretion from beta cells in intact mouse islets is targeted towards the vasculature. Diabetologia. 57, 1655-1663 (2014). 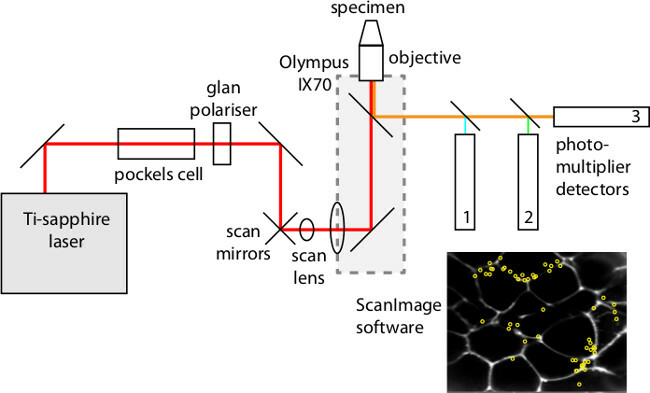 Pologruto, T. A., Sabatini, B. L., Svoboda, K. ScanImage: flexible software for operating laser scanning microscopes. Biomedical Engineering Online. 2, 13 (2003).